Showtune Sunday: Oscar night performances of nominated songs from Barbra, Diana and Celine! It’s well-known that Barbra Streisand won the Academy Award in 1969 for best actress for Funny Girl. 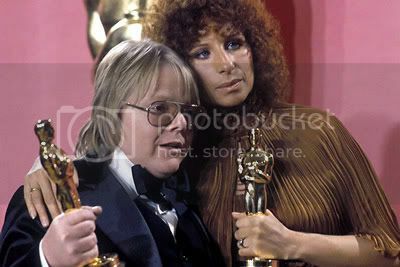 What some people might not know is that Miss Streisand won a second Oscar in 1977 – this time in the best original song category. Barbra co-wrote Evergreen, the theme from her movie A Star Is Born, with Paul Williams and they took home Oscar gold (as well as a Grammy). Here is video of Barbra performing the song at the 1977 Oscars (she’s introduced by Jane Fonda!). Also, here is Diana Ross and Lionel Richie performing their massive hit Endless Love (from the film of the same film) which lost the Oscar to Arthur’s Theme. And finally, here is Celine Dion at the 1997 show performing I Found Someone from Streisand’s film The Mirror Has Two Faces. Natalie Cole had been scheduled to perform the song but fell ill. Streisand says she offered to step in but producers opted to go with Celine Dion instead who was already there to perform one of the other nominated songs. As you can see, Celine performs the song with the music right in front of her – she had to learn it on the fly! nice to see some celine coverage on your site, greg! good stuff, as always.